The Shark S6001UK is excellent for large houses. 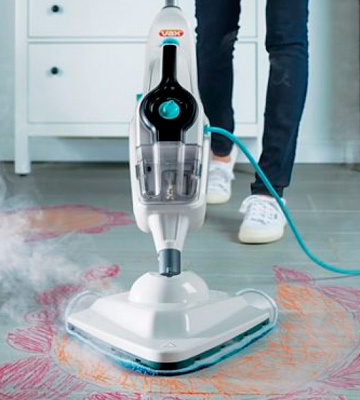 Thanks to the double-sided pads and Klik n' Flip technology, you can clean and sanitise twice the floor area, thus, saving your time and effort. 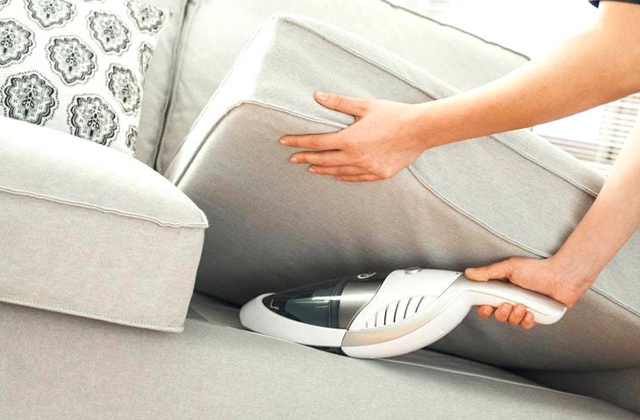 A convenient on-board storage of attachments allows you to replace them while using the steam mop. The mop is quite heavy. We recommend this steam mop to people who wish to clean the floor from dirt (or dust) and disinfect it, as the appliance comes with a detergent straight out of the box. 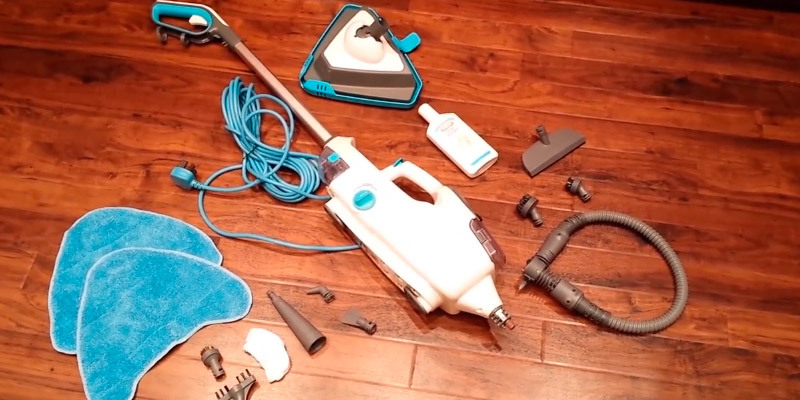 This steam mop is super easy to assemble and use. It's ready for work in just 15 seconds and seems to last for ages without refilling. 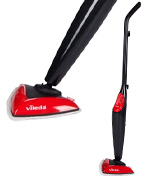 If you need a powerful steam mop for wood floors as well as other surfaces, the Vileda Steam Mop is your choice. 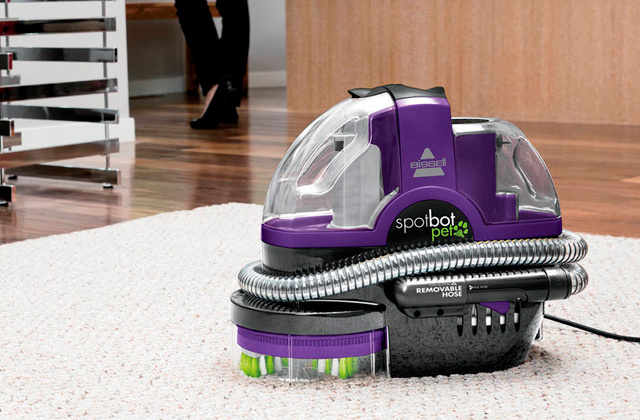 It has 2 steam settings for different floor surfaces and comes with a special glider for refreshing carpets. 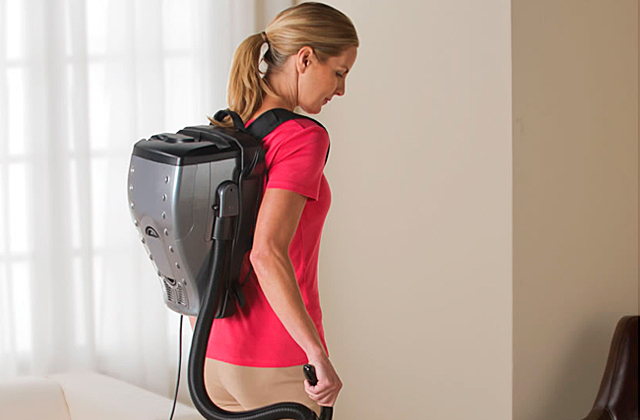 A comfortable shoulder strap will facilitate carrying the mop while steaming. The mop is a bit clumsy to hold. This steam mop is a great option for people seeking a powerful bog-standard appliance for steam cleaning with the ultimate comfort. 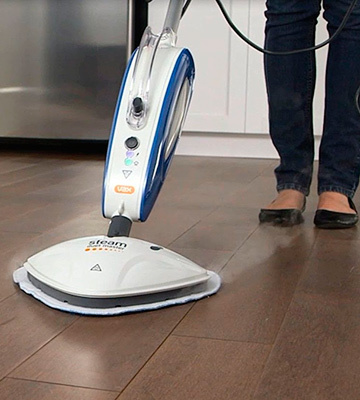 Although it's quite a powerful steam mop, it consumes very little energy and boasts the most energy efficient class A. The Russell Hobbs RHSM1001 cleaning mop is an extremely safe, reliable, and easy-to-use appliance. It has an auto cut-off function which disables steam in an upright position. Even kids can use it. 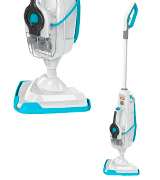 The S6001 Klik n' Flip is one of the most advanced and efficient models in the Shark's steam mop lineup. At 1050W, it delivers a consistent, superheated jet of steam. And if you need to tackle stuck-on and stubborn dirt, you can activate the "Steam blaster" mode and direct a powerful blast of concentrated steam right onto the tough stains. 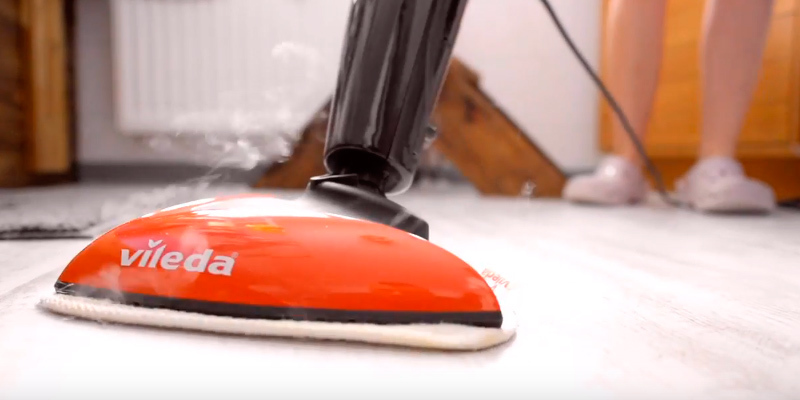 The concentrated steam comes from the nozzle, and after the successful attack, you can flip the head back and wipe away all the mess with only one pass of a mop pad. Yet, the biggest selling point of this steamer is the Klik n' Flip Technology. The trick is that it has double-sided Dirt Grip cleaning pads. And with a quick flip of the mop head, you can clean twice the floor area, which is perfect for large rooms. Needless to say, larger coverage means quicker cleanup. After you’re done, you can release the dirty pad from the head with just one click of the switch. Two included pads are machine-washable, meaning they will save you costs on the replacement in the long run. They are made of high-quality microfibre and can not only effectively trap dirt but also deliver amazing absorption. The steam is distributed evenly throughout the mop head and pad as you push the handle. The appliance is very easy to control and navigate. 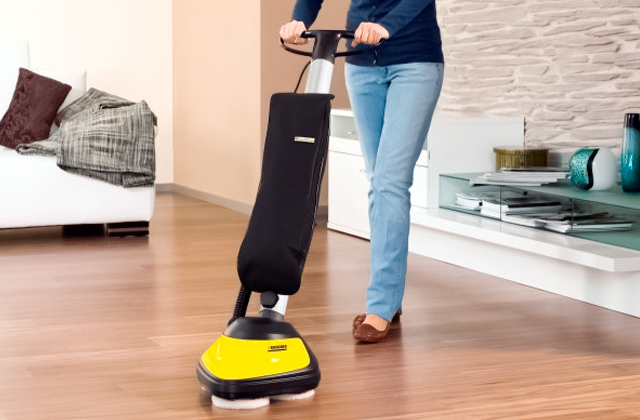 It has swivel steering for better manoeuvrability on floors and around the furniture. Overall, it's a perfect steam mop for those who need to sanitize large areas quickly and effectively. 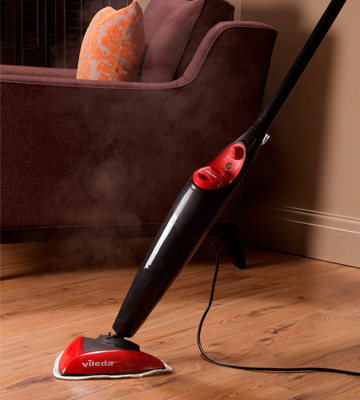 We’d like to present a powerful steam mop by VAX. The company is known for having designed the world’s first mopping vacuum which was able to collect water. But, naturally, here, we are reviewing a different model that is peculiar for its two tanks - a 260ml tank for water, and 200ml tank for detergent. Pick a combo of the powerful steam generating system and the vapour jet, and any dirt or mud will surrender. The body of the appliance features the steam control dial, so you can smoothly adjust the steam feed depending on the surface being cleaned. By the way, the mop gets ready to work within 20 seconds and is able to work up to 15 minutes. And you won’t have to drag the mop from one socket to another, as the 7m cable will provide a comfortable working area all over your room. This steam mop is extremely convenient thanks to the all-around floorhead that allows cleaning not only parquetry or carpets but other surfaces as well. For example, a special attachment will let you clean a stove or a microwave oven and other surfaces from grease. Also, with the VAX steam mop, you’ll be able to make your chromed bathroom items blazing and quickly get rid of dust on a bedside table and a wardrobe. Apart from that, you will be able to clean furniture and pillows, windows and mirrors thanks to a wide range of attachments included in the package. In addition, the mop comes with a detergent, so you can start cleaning your home right after unpacking! In all, we can confidently recommend this steam mop to everyone willing to clear floors from dirt and dust and remove bacteria with the help of a washing agent. For the price, this little steamer works just perfectly. And although it doesn't come with tons of attachments that you may never use, it's well-built and effective on any surface. Out of the box, it's very easy to use. The mop comes in four pieces which require simple assembly - just click them together and you are ready to go. Once fully assembled, it stands surprisingly tall at around 130 cm, so you'll certainly won’t need to bend while cleaning. The handle is very sturdy, however, it has neither extra padding for comfortable handling nor special hook for the cable storage. The positive thing is that the handle stands up on its own instead of clattering to the floor when you let it go. With a convenient ball arrangement, it turns easily and can get into hard-to-reach places including spots under the tables, chairs and even baseboard of your kitchen cupboards. And the triangle-shaped head means that you can get into all nooks and crannies and make them really clean. 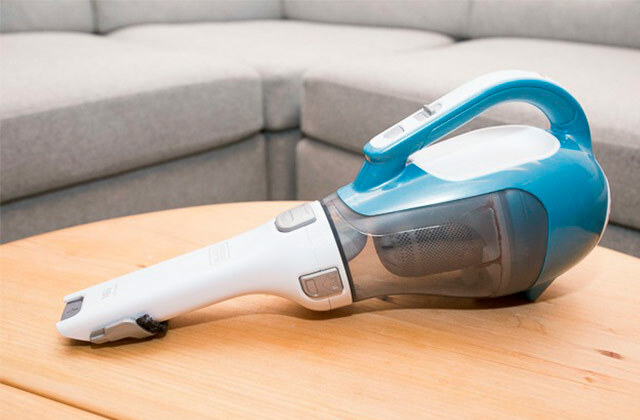 The power cord of this steamer is long enough to let you clean large room. The mop does heat up fairly quickly. It gets up to steam in just 15 seconds and seems to last quite for a long time without refilling. 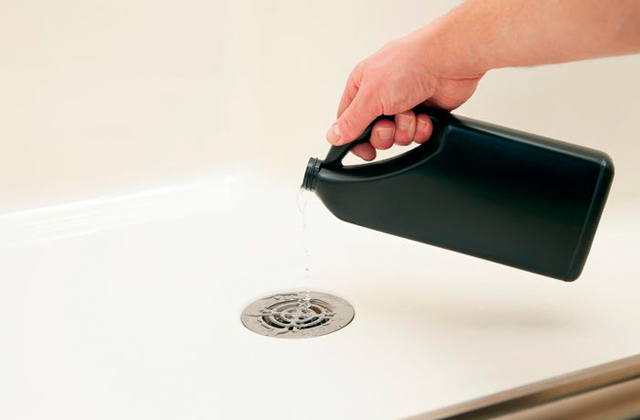 The package includes a jug for easy filling of the water tank. Though you can't see how much water is left in the tank, the indicator light notifies you when the tank is empty. 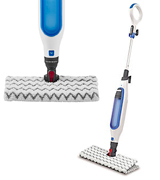 The mop offers 2 steam settings for different floor types. The high mode is good for tiles and other hard floors, while the low one is great for vinyl or laminate floors. Additionally, there's a carpet glider device in the box. Essentially, it's just a plastic shoe that should be attached over the cleaning pad for giving your carpets a ‘refresh’. The Vax S7 is the next model we are going to tell you about. 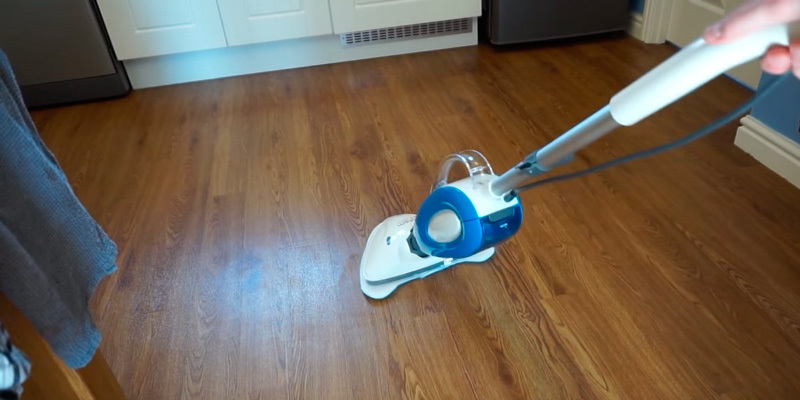 This is one of the simplest and the most efficient steam mops on the market. Having the power of 1600 W, this appliance heats up within just 20 seconds. 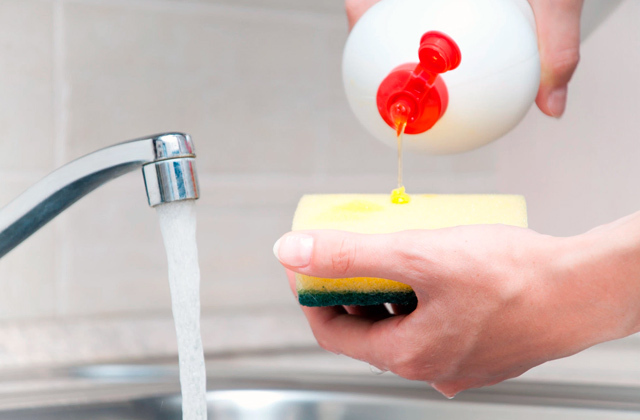 After that, you can start cleaning with the help of various attachments for different surfaces. Having filled the water container to the full, you'll use the mop for 15 minutes that's enough for a thorough floor cleaning. 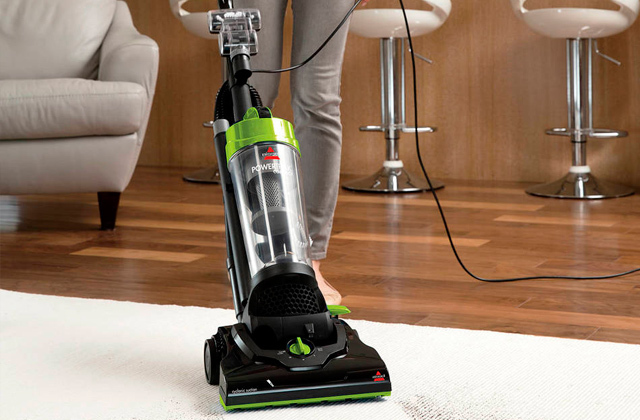 Like other steam mops, the Vax S7 is able to clean not only floors and carpets but other household items. Once you disconnect the floorhead from the mop, attach a squeegee, cloth or brush to clean tiles and their spacings, a stove plate or oven, bathroom utensils, and furniture in your room. Moreover, you'll be able to clean the most hard-to-reach spots in your room thanks to the long hose included in the package. This hose is particularly convenient to handle when the mop is hung over your shoulder as it comes with a strap as well. All in all, this accessory will let you clean your home thoroughly without tiring and straining your hands. 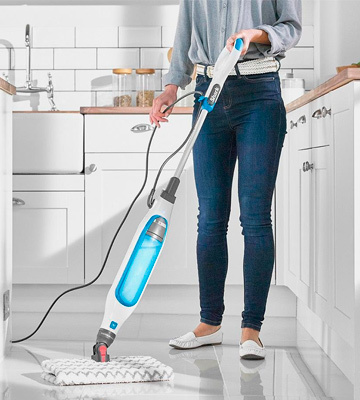 So, having analysed all the features of the Vax S7, we can say it will be a great appliance for people who need a powerful mop with essential functions and conveniences for productive cleaning. 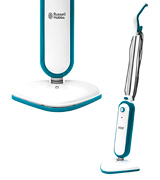 The Russell Hobbs RHSM1001 Steam cleaner is light in your hands and light on your budget. 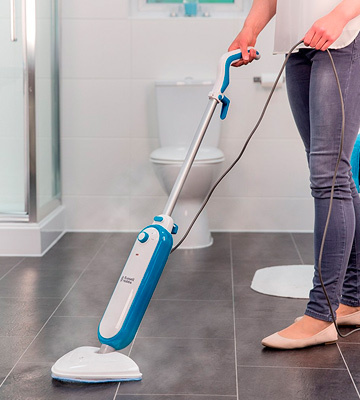 For less than £55, you'll get a decent steam mop that is very lightweight, quick to steam, easy to use, and that can really work a treat. 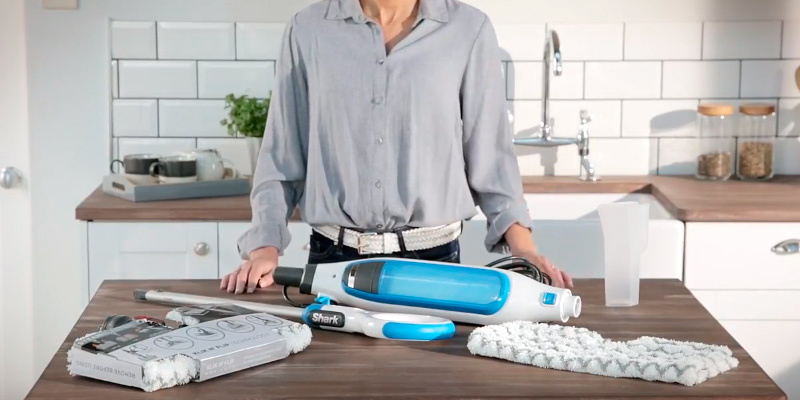 Equipped with a generous 8-meter cord and being just 2.3 kg, the mop is convenient to carry around without the need to change sockets too often. It's very easy to assemble with no screws and bolts. All parts just neatly click together. After the assembly, you simply need to fill up the tank (using the handy jug provided in the package), then plug in the cable, wait for 15 seconds, and you’re ready to start chemical-free steam cleaning. The high-temperature continuous steam this mop delivers can kill up to 99.9% of household germs, leaving your floors shining and sanitised. The runtime of this steamer makes about 15 minutes, however, take note that it has no indicator to show you how much water is left in the tank. 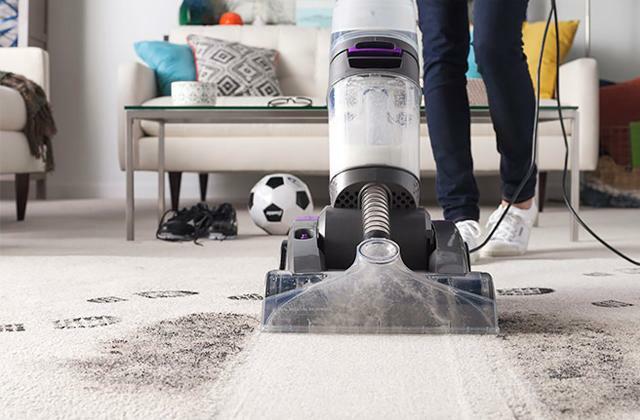 The steamer is supplied with two machine-washable microfibre mop pads which are ideal for trapping all dirt, grease, and grime from your floors and carpets. The pads can be swiftly attached to the mop head. 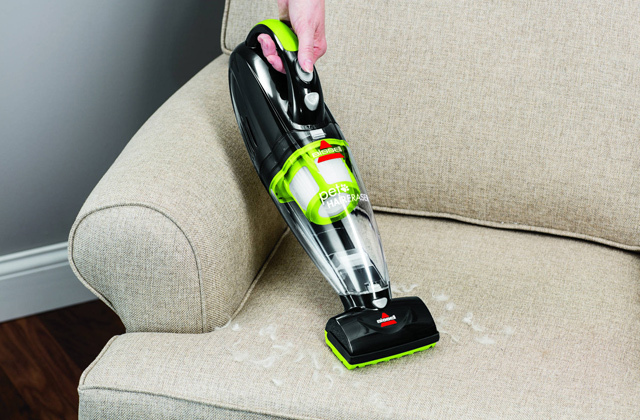 By the way, the swivel optimally-shaped head has a low profile and can easily remove dirt from hard-to-reach corners as well as under and around furniture. For enhanced safety, it has an automatic steam cut-off feature. If it's standing vertically, the steamer switches off, and at an angle, it switches on. This mop also comes covered with a free 1-year warranty, and one more free year is available upon registering the mop on the 'Product Care' website. In a word, it's a very safe and reliable mop for thorough cleaning of your floors and carpets. Surely, each homemaker would like to cope with domestic chores quickly and easily. Today, we have a lot of household appliances that make cleaning so easy, and steam mops are one of them. This device is a mop featuring a steam system capable of cleaning not just floors but also some other parts of house interior such as bathroom fitments, windows, mirrors, tile, carpets, etc. 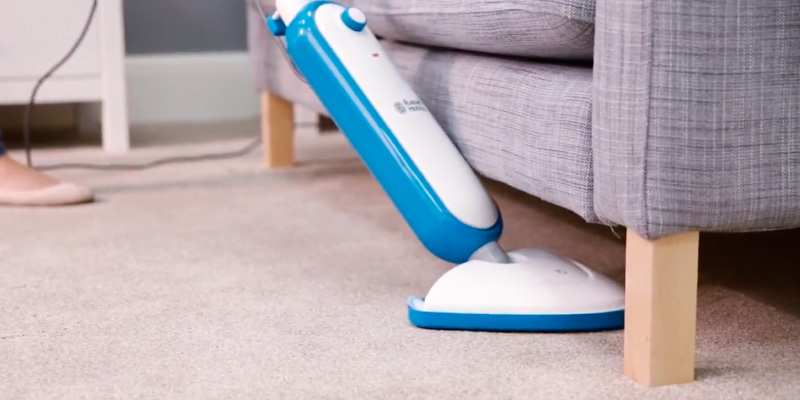 Such fantastic cleaning capabilities are possible because of special attachments that usually come with these mops - for example, carpet gliders or scrubbers. We have rounded up the top steam mops available on the market and shed light on the main features worth paying attention to while choosing a steam mop. 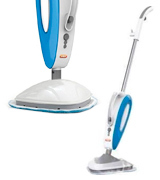 A steam mop usually consists of the main unit, cleaning head, and handle. The main unit commonly features a water tank, steam generator, and control elements. Let’s describe steam generators in detail. Their power ranges from 1200W to 2000W, and the higher it is, the more powerful the steam output is. The power of a steam mop is also vital for its starting time. Them, you should consider all the attachments (cleaning pads) of every appliance. They can be of rectangular and triangular shape for cleaning areas around furniture or sanitary equipment. Some attachments can rotate for a more effective cleaning. Control elements may be located on the main unit and handle; generally, they include the “on” button and steam regulator. The steam output can be gradually adjusted by rotating the regulator or operating the pump. The steam adjusting may be fixed as well; you should choose one of a few levels by pressing an appropriate button. It is worth noting that steam mops may come with and without steam regulators. Furthermore, a steam regulator adjusts not just the blast of steam, but dampness and heat too. It is very important since an excessive dampness or heat may damage the floor, particularly if it is made of a soft wood. Some models feature steam regulators that are able to shut the steam off for conventional damp sweeping. The performance of a steam mop is the next point to pay attention to. It depends on the water tank capacity and additional attachments that expand the field of application. Look at steam mops with large water tanks to avoid frequent refilling. Additional attachments and pads will make cleaning far more effective and fast. For instance, a wide attachment will let you cover a large area for one sweep with the minimum time and effort. If you need to wash the floor only, look for washable microfiber pads for parquet or linoleum flooring. If you need to remove dirt in corners or cracks or clean tiles, microwave oven, or even bathroom, you will need a special attachment generating a powerful vapour jet. Should you clean carpets or sofa from dust or spots, use the special cleaning pads that don't harm the texture of your furniture. Cleaning without chemicals is, probably, the main peculiarity of steam mops. 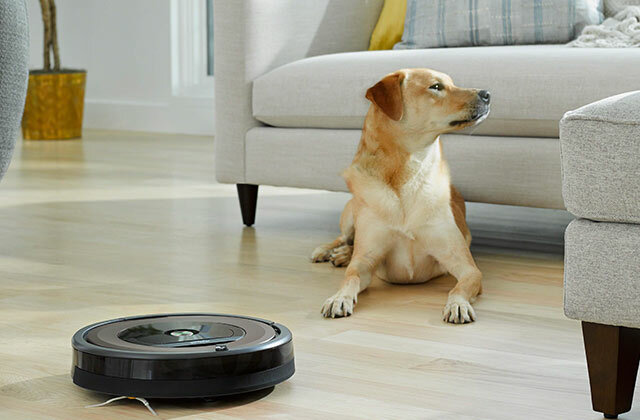 When you use a steam mop, you shouldn't worry about the health of your family and pets that love to rest on a cool floor. Besides, a steam mop will be a great choice for the allergy sufferers, as the steam kills all the offending agents. In addition, you will save a considerable amount of money for antiallergic medicines. Pay attention to weight and length when you choose a steam mop. If a mop is heavy, you’ll not get much pleasure of it and will get tired quickly. So, we advise you to look for medium-weight steam mops that will be easy to carry and manoeuvre. Consider the length of a handle; it should be long enough to reach the places you need to clean and let you work without a chair. Lastly, check the length of a power cable. If you don’t want to run between the power sockets in your house or flat, look for the models with long cables. 1. Steam Mop Buying Guide, Consumer Reports. 3. 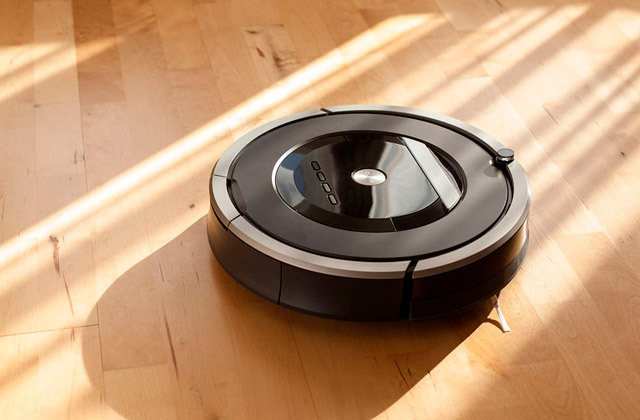 Sarah Ingrams How to buy the best steam cleaner, Which? 4. Rebecca Ciaramidaro Steam mop buying guide, Choice. August 8, 2016.